Tommy: It’s the final weekend before the Non-Waiver Trading Deadline and the Atlanta Braves are in the middle of scores of rumors. Atlanta has already completed two trades as they pull off the shocker and find a new home for the well-liked, well-regarded, well-travelled, well-named Chaz Roe. Oh, and they traded Jaime Garcia, too. But will that be it? Chances are no. Atlanta is in a weird place where they both want to sell off assets they no longer need or want and also acquire assets that they can play a role for next year’s club and beyond. It builds on last year’s efforts in which guys like Kelly Johnson and Jeff Francoeur were shipped out but Matt Kemp was acquired (albeit, in large part to get rid of He Who Shall Not Be Named). That is why the Braves have both been shopping deals for Brandon Phillips and trying to acquire a big name starter – such as Sonny Gray. On Tuesday, you talked about Gray, Stephen. The price tag for such a pitcher is stiff, but the reward is potentially great as well. After an injury-filled down year in 2016, Gray’s numbers have reverted back to their 2014-15 levels in which Gray posted a combined 6.8 fWAR during his first two full seasons in the majors. In his Age-27 season, Gray has two more years of arbitration left and if he continues to pitch at his current level, could be peaking at the right time. Gray has his issues – which many fans are quick to point out. He’s a groundball pitcher who relies a good deal on his defense making plays. That said, he is carrying a career-high 23.5% strikeout rate into action Wednesday so it’s not like he can’t get strikeouts. A big reason for his increased strikeout rate is a better feel for his changeup, which has made it more effective. Others would point out that he’s a health risk. A pair of unrelated injuries put him on the shelf twice last season while a lat strain suffered in spring cost him the first month of action this season. It’s worth mentioning that he threw 427 combined innings in 2014-15 so he’s flashed durability in the majors. Like most potential trade targets for the Braves, the fit for this version of the Braves is a clear upgrade. The Braves’ rotation has looked improved after the release of Bartolo Colon and improvement of R.A. Dickey, but it remains one of the weakest collection of starters in baseball and that was before you remove Garcia from the mix. Adding Gray won’t fix all of those problems, but adding him means Mike Foltynewicz isn’t the team ace. It means Julio Teheran‘s struggles might be easier to deal with. 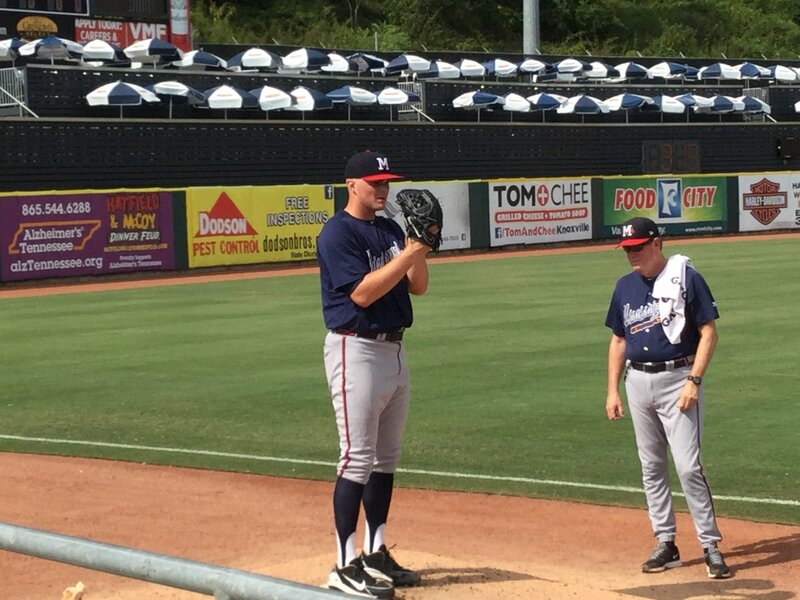 It means Sean Newcomb‘s emergence over the final two months is a little less important. Those three are controlled through 2019, the earliest Gray would hit free agency. But the biggest issue in regards to Gray is the price tag – and I’m not talking salary. The first player the A’s have apparently asked about was Ronald Acuna. Naturally, that is a non-starter. Ozzie Albies is logically the next player the A’s might be interested in – though a package of Cristian Pache and pitching arms (along with a closer offensive prospect like Dustin Peterson) might be enough to convince Billy Beane. Of course, that’s a best-cases scenario and those don’t develop often. The Braves’ interest in Gray is at least matched or exceeded by other clubs, including the Yankees who are considering a blockbuster deal for both Gray and Yonder Alonso. Such interest inflates the price for Gray even more. I’m going to throw out my thinking and see if it matches up with you two. Stephen, I think we’re on the same side of things actually. Is Gray worth a top package? In this market? Abso-freaking-lutely. But is he worth a top package of Braves prospects to the Braves? Here is where I start to pull away. If the Braves can discuss an Albies/Acuna-less package of players and the A’s sign off on it, I’m game. Let’s make a deal. But if the A’s hold out – and they probably should – for Albies or Acuna, I’m walking. So, to you two, what are the chances the A’s do go for a package without Albies or Acuna? Should Atlanta at least consider a swap even if Albies is in it? And more generally, do you believe Gray is “that guy?” Is he a pitcher worthy of such a price tag in the first place – whether or not you’re willing to pay it withstanding? Stephen: Hello boys. Always enjoy these. Yeah so obviously I just wrote about this so my thoughts are pretty well known. From the A’s point of view, they see the package the White Sox just pulled in for Jose Quintana, which included one of the best prospects in all of baseball, and they want something similar, which is fair. There was a report out yesterday they were interested in Ronald Acuña which is close to water being wet territory in terms of newsworthiness but they have every right to hope for the moon. And, honestly, given their financial disadvantage, it would be committing malpractice if they didn’t at least ask. But asking doesn’t mean getting and there’s zero chance Atlanta gives up any of their top prospects for a guy who’s only under control for 2 more years after 2017. And it’s that last part that really is the crux of the issue with Gray. I think he’s a fantastic pitcher and I may even be higher on him than most but, as I wrote yesterday, while matching up talent is important, matching up timing is equally important. Atlanta simply isn’t ready to maximize a guy like Gray with multiple playoff berths because they simply aren’t there yet in their timeline. I really like Sonny Gray and there will come a point where acquiring a guy like him is exactly what Atlanta needs to do. They just haven’t reached that point yet. Ok Ryan, how do you see the Sonny Gray situation? Ryan: If there was some way for the Braves to pull off a quantity over quality, sending the A’s 4-5 mid-level prospects that don’t seem to factor into the Braves future plans, then I’m all-in. Unfortunately, this is not going to be the scenario and Sonny Gray will likely land two blue-chippers and a few throw-ins. For me, that’s a kicking and screaming NO! If he was under control for four years and hadn’t had injury problems or lackluster results last year, I’d be down. But make no mistake, this is a buy-high and he’s THE guy right now that many teams want and Braves just aren’t in a position to be selling their farm yet for 2.5 years of control. John Hart said this after the Braves went and met with Jon Lester prior to his free agency: “He’s the right guy at the wrong time”. Stephen: So it looks like we all agree trading for Sonny Gray wouldn’t be a wise decision given where the team currently is and what the price reportedly is so let’s move to the next guy. Our next candidate certainly isn’t one we have to worry about how long the team controls him. 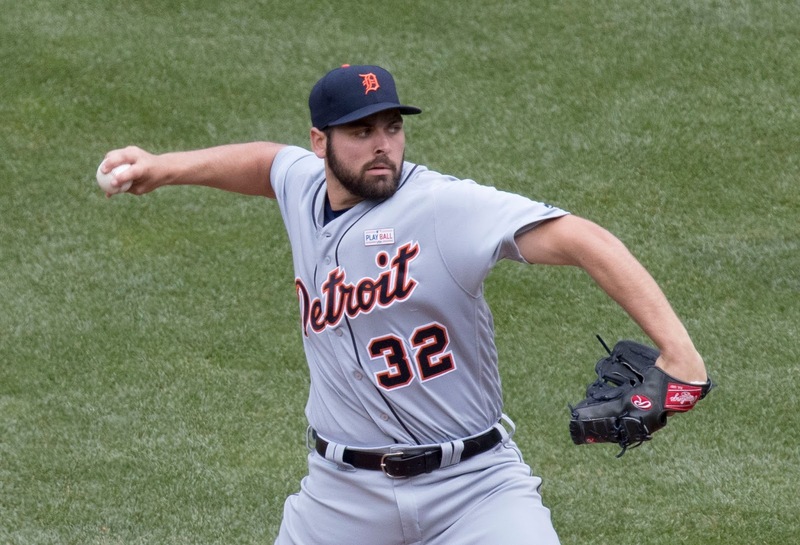 Michael Fulmer is having a really good sophomore year for the Detroit Tigers, who appear to be on the verge of their own rebuild. Detroit has spent the last decade paying for the present by mortgaging their future and it looks like that bill is about to come due. Massive long term contract to aging players have left the Tigers without many actual trade chips which is why they may consider moving Fulmer for the right price. One thing that makes him so attractive as a trade piece is his age, and therefore his salary. Fulmer is 24 and in his second year in the majors meaning he has 4 years of team control at a highly affordable rate. Another positive for Fulmer is how he’s able to consistently keep the ball on the ground. His ground ball rate sits at 50%, well above league average, which obviously means he’s also able to get the ball in the ballpark. In a perfect world, I’d like to see him miss a few more bats but you can’t have everything. All of this, of course, means he wouldn’t come cheap in a trade and if Atlanta really wanted him, it’d take a decent size chunk out of their farm system. The other possibility from Detroit would be taking on Justin Verlander and some of his mega deal. Verlander is getting paid $28M a year for the 2018 and 2019 seasons before becoming a free agent again so Detroit would definitely have to take on a chunk of that just to give him away. If they want anything real in return, they’d have to take even bigger of chunk. The primary reason for that is Verlander really isn’t that great anymore. He has league average ERA, league average FIP, league average strikeout rates…you get it. He’s just an average pitcher now and while that has value, it doesn’t have 28M/year in value. Ryan: When discussing Fulmer, not much is different from my opinion on Gray, and that is the Braves just aren’t in a position to do a move like this quite yet. If the next wave of pitchers and position players come up (Acuna, Albies, Soroka, Allard,etc.) and show they can be big league commodities, then a surplus develops and it’s easier to bite a chunk out of the farm. So, for me, I’m not ready to see a trade that costs the Braves 3-4 top 10 prospects. Now Verlander? You’re getting into my territory. Regardless of what the Tigers say, a Verlander trade will not bring a big haul back to Detroit. This is where the Braves could land a dependable starter at a discounted prospect price and, hopefully, a discounted actual price. However, in regards to this kind of move, Verlander is down my list 2-3 spots. Tommy: Essentially, we are hoping to be on the other side of a Melvin Upton/Craig Kimbrel exchange here. Pay less in terms of prospects because you are taking on an overpriced asset that could make it more difficult to rebuild. It worked out for the Padres as when they used the desired commodity (Kimbrel) in another trade, they got much better value than they surrendered in the first place. The problem I see is will Verlander agree to a trade to a team that isn’t yet in contention? He carries a full no-trade protection – something Detroit hands out like candy – and can Atlanta even convince him to come south even if they wanted him to? Separating Fullmer from Verlander might be not only more preferable for the Braves, but a necessity if Verlander declines to go with Fullmer. Another pathway isn’t as dramatic but still, would give the Tigers a little financial freedom. Taking back Ian Kinsler in the trade would save the Tigers roughly $9-$10M when you factor in Kinsler’s buyout for 2018. Atlanta could try to flip Kinsler, of course. They could also take back Anibal Sanchez, who is owed around $12-$13M (another $5 buyout for next year included). Again, these are not significant salaries to tie in with Fullmer, but other assets like Justin Upton and Jordan Zimmermann have some degree of no-trade protection which could make it difficult to trade for their contracts – which is essentially what we are talking about here. Say Verlander does agree. There might be a way to keep the Tigers from not having to pay the Braves money to pay off some of the right-hander’s salary. The Braves could opt to send Matt Kemp to the Tigers. There are a couple of problems with such a proposal. One, the deal doesn’t provide enough financial relief. Kemp’s salary is about $13M less over the next two seasons than Verlander. Detroit might want a little more financial freedom and the Braves could offer to add an additional $3.5M the next two years to give the Tigers at least $20 extra million in financial relief over the next two seasons – plus whatever prospects. As for the prospects, Atlanta can use their wealth of starting pitching plus some positional prospects to try to smooth over a deal. Say something along the lines of Aaron Blair, Kolby Allard, Lucas Sims, Travis Demeritte, Kemp, and $7M for Verlander and Fullmer. I’d also see what it might take to add Justin Wilson to the trade and hope the presence of Verlander might keep Wilson’s price tag from not being as significant as this trading market demands for good relievers. Ryan: Well that was more like it! All different takes. I like it! I just feel with Fulmer’s asking price and Verlander’s expensive contract and a no-trade clause, we just typed a whole lot for nothing. But if we really want to start typing a bunch of nothing, let’s talk about Christian Yelich and Giancarlo Stanton! Yelich: Under team control through 2022 on a team friendly deal that would max out at a total of 58.25MM for ‘18-’22 (5 years). Stanton: Lifetime contract, bajillion dollars. I mean, heck. That’s what it seems like. Seriously, the contract runs through 2028 (he’d be 39) and it pays him anywhere between 25 and 32MM annually. There’s minuscule chance a mid-market team takes on Giancarlo’s absurd contract, especially one as frugal as the Braves. Yelich is a good player, but as stated above, the price at this point just doesn’t make sense for the team. The next wave needs to hit and Braves need to see what sticks before really addressing any areas of need and trading away assets. There will be some traded, but I don’t think trading now is the answer. Tommy: For a change, I’m kind of hoping you aren’t wrong. I love Christian Yelich. Absolutely love the guy. Even though his numbers are a little down compared to last year, he’s one of the quiet superstars in the game and a big-time performer in the lineup. With Giancarlo, it’s hard not to love his power. 240 homers in less than a thousand games? Yes, please. He has a good idea of the strike-zone and gives his team impact potential with each plate appearance. But unlike Yelich, his contract is just all kinds of ugly for the franchise. Especially for a guy who has avoided time on the DL just once in his seven full-time seasons. So, that brings me back to Yelich and I have to admit it’s difficult not to get a little nutty here. Can you imagine an outfield of Yelich, Ender Inciarte, and Ronald Acuna? It’s an embarrassment of riches. Oh, and he has four more years under his contract for a very affordable deal as you brought up. 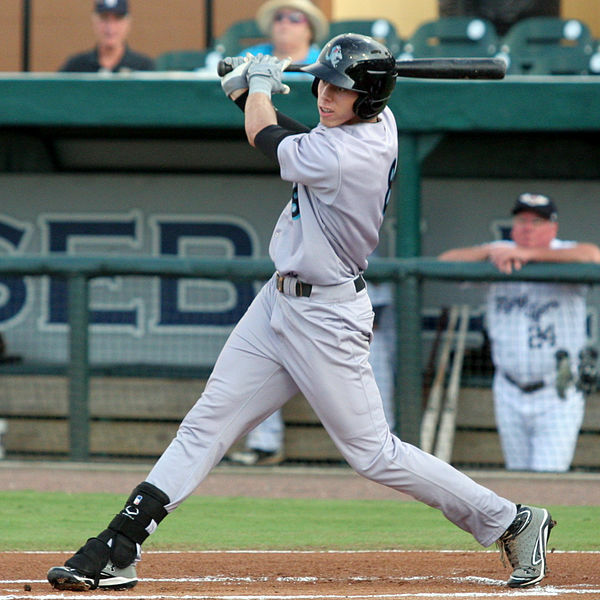 Yelich is exactly the kind of expensive, controllable player the Braves are seeking. He’s signed long-term to a contract that suits the team very well. Here’s the “but” because we knew it was coming. But this only works if the Marlins are willing to take pitching and a lot of it. Luckily, the Marlins desperately need that particular commodity. The unfortunate death of Jose Fernandez left them with a massive hole in their rotation that is currently relying on Dan Straily and Edinson Volquez to fill in the void. Further, while the Marlins have some decent arms in the minors, what they don’t have is a Kolby Allard, or a Mike Soroka, or even a Luiz Gohara. The farm system has been wrecked in recent years and currently has no one in the MLB.com Top 100. As for Stanton…he can continue to enjoy Miami during a rebuild. Stephen: So this is interesting and a place where I probably differ than most. First of all Ryan is correct, the likelihood of either of these guys being moved is slim at best considering the team is currently in the process of being sold. Moves like this are usually made by the new owners, not the old ones, so while Miami eventually will have to make some tough decisions on these guys, it probably won’t happen until after they’re sold. But if we only talked about trades that are likely to happen, we’d never talk about trades and where’s the fun in that? Yelich is a fascinating player to me because everything about him screams superstar except one really weird thing. Since he debuted in 2013, no player in the NL has hit the ball on the ground more than Christian Yelich. He’s at almost 60% for his career and that was shocking to me considering the numbers he’s put up. You add that to the meh offensive year he’s having this year (113 wRC+ GB% at 57%) and the exorbitant cost it would take to acquire him and I don’t know, I pause. It’s silly because he really is a great player but he just has to do so much damage on the ball he doesn’t hit on the ground, it just gives him a smaller margin of error than most. I know I’m stupid. With Stanton, normally I prefer the route of taking on money to acquire talent instead of giving up prospects. Money replenishes at a quicker rate than talent does. But this is a whole new level of money. Stanton is still owed 295M over the next 10 years and that much money combined with his injury history would give me cold sweats at night as a GM. The talent is unprecedented but the value is the combination of talent and cost and right now, Stanton’s cost speaks louder than his talent. Unless Miami is willing to eat significant dollars, it’s a hard pass for me. Tommy: All of that is fair, Stephen. Moving on from guys that are getting a lot of trade rumors play, I want to move onto the guy we think is the best fit for what the Braves might need. And with that in my mind, the Braves should go after Marcus Stroman. Before I address the mega elephant in the room, Stroman is in his fourth year since coming up in 2014. There’s a missed campaign in 2015 where he made just four starts, but other than that, he’s been a durable workhorse. The only other time he missed any notable time was because of a suspension for methylhexaneamine, a common “stimulant found in over-the-counter dietary supplements” back in 2012. And that injury I mentioned? That was knee surgery – not an arm issue. Since 2014, Stroman ranks in the Top 30 in both FIP and xFIP. He has the second-best groundball rate in that time frame to Dallas Kuechel, who is a very similar pitcher. He does everything you are looking for and he’s only improving as he’s getting more whiffs than ever. His sinker is one of the best versions of that pitch and he uses it half of the time – without suffering as a result. 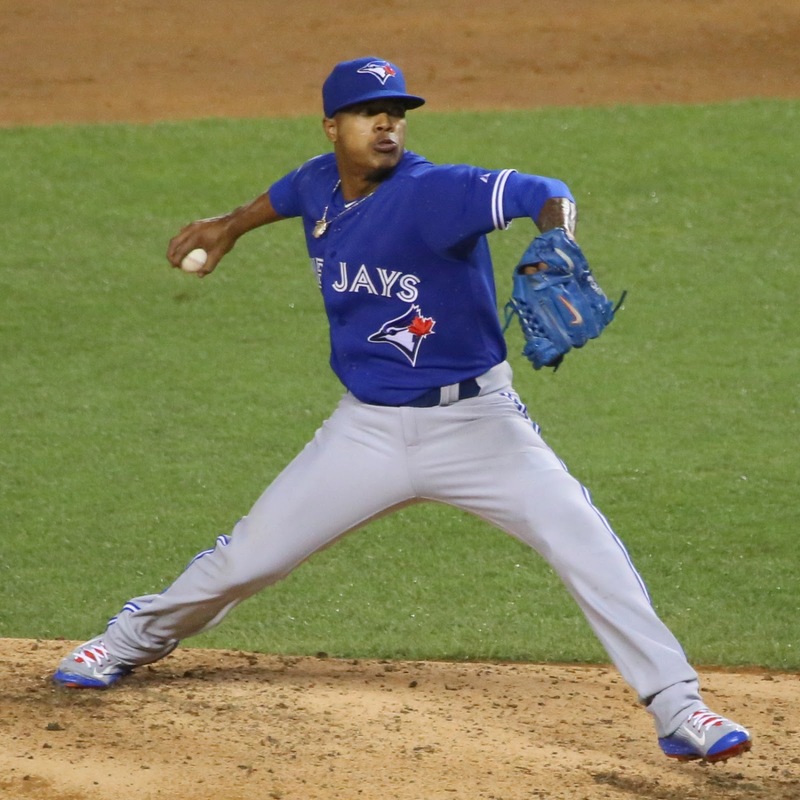 Stroman is also one of baseball’s top showman – a reason to put butts in the stands and enjoy one of the game’s very best practicing his craft. He even hit his first homerun this year in interleague action. He should be in the NL where the antiquated idea of a pitcher hitting is still in vogue. But there’s a catch. He won’t come cheap and I don’t just mean the package the Braves will have to surrender. As a Super 2 arbitration-eligible player, Stroman already has reached the $3.4M plateau in salary after beating the Jays in arbitration last spring. That means big money for both 2019 and 2020 as he goes through a third and fourth year of arbitration if he’s not signed to a long-term deal beforehand. And then there’s the price in prospects that make this deal a little pie-in-the-sky. Okay, “little” is an understatement. The Blue Jays apparently aren’t interested in dealing their controllable assets. I wouldn’t be either, but the Jays aren’t exactly getting younger. The Braves could try a similar approach to the Fullmer one we discussed and take back salary to make the deal more attractive. J.A. Happ is due $13M next year and the Jays could jumpstart a quick rebuild centered around their influx of young-and-talented position prospects and the pitching prospects the Braves and others might surrender for their assets. The price would be significant. Likely, it would be too much to bear. But if there is some room to work here, Stroman would be the perfect addition at the perfect time for the right team. Stephen, who is your guy that you think will fit perfectly for the Braves? Stephen: So my guy is a little out of nowhere and I’m not sure how many people have ever actually heard of him but I want 3B Yandy Diaz of the Cleveland Indians. Yandy has been on my radar for a couple years now as it’s become clear that 3B was a bit of an organizational hole. He got a cup of coffee in the majors earlier this year but he’s basically a prospect at this point. Of course when I see that, what I see is 5 or 6 years of team control at an affordable rate so that’s a plus for me. That kind of production matched with that kind of discipline is rare and I’d love Atlanta to find a way to get him. Cleveland is a win now team with an All-Star 3B in Jose Ramirez so it’s not crazy think Diaz could be had if Atlanta could send something their way to help their 2017 club. Their catchers and 2B have been pretty terrible this year so maybe some combination of Phillips and Suzuki plus maybe a reliever? I don’t know. All I know is Yandy is exactly the type of prospect I think gets undervalued in today’s game. His consistent production against the highest levels of minor league baseball combined with his rare level of plate discipline make him one of my favorite potential targets and one I hope Atlanta takes a serious look at. Ok Ryan, who’s the guy you hope the Braves make a run at? Ryan: Well…it’s no secret that my buy-low guy was Jeff Samardzija but that has been stomped and burned as we found out a few days back that the Braves are not one of the teams that he’d accept a trade to…disheartening. There were some wrinkles when acquiring The Shark but combine his peripherals with a team that (hopefully) features the best framing catching combo in the league (and yes, this is my plug to extend Suzuki for another year) and I think we could have had a K-machine that sports a mid-3 ERA. In addition to that thought, I think the Giants would have to send over a good chunk of cash to get any deal done. Yet, once again I typed a paragraph for no reason…so I’ll move on now. Braves get Chase Headley, Michael Pineda, Dustin Fowler, Miguel Andujar, and 2 lower level prospects. A future 3B, a 2018 fill-in 3B (or offseason trade piece), a future star RFer, and a roll of the dice stud SP. Who’s with me? Likely not Yankees fans! Go Braves!